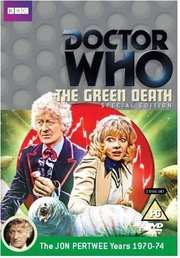 It's that time of the month again, where we look at what BBC Worldwide have coming our way for the following month, and we start with one of two Who discs due on 5th August, Doctor Who: Green Death Special Edition with Jon Pertwee. Carrying a recommended retail price of £20.42, extras include a mockumentary starring Mark Gatiss, plus interviews with writer Robert Sloman and actor Stewart Bevan. UNIT is called in after a miner from the Welsh village of Llanfairfach is found dead, his skin glowing bright green. Jo joins forces with a local environmental group, led by Professor Clifford Jones, while the Doctor investigates the nearby plant of a company called Global Chemicals. They discover that the mine workings are full of giant maggots and green slime, both lethal to touch, that have been produced by chemical waste pumped from the Global plant. Out on the 12th August is a DVD delayed from July, Count Arthur Strong, which we covered last month so you can go read about it here. Then we have three titles turning up on 26th August, the first of which is the second Who feature for this month, Doctor Who: Ice Warriors with Patrick Troughton, Frazer Hines and Deborah Watling. This also comes with an RRP of £20.42. The TARDIS arrives on Earth at the time of a new ice age and the travellers make their way into a base where scientists commanded by Leader Clent are using an ioniser device to combat the advance of a glacier. A giant humanoid creature, termed an Ice Warrior by one of the scientists, has been found buried in the glacier nearby. 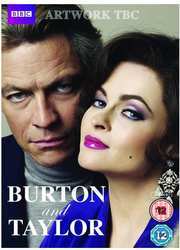 If real life based material is more your thing, then BBC Four feature Burton and Taylor might be more for you. Starring Helena Bonham Carter and Dominic West, the DVD will retail for £13.27. This film aims to capture the highly explosive nature of the Elizabeth Taylor and Richard Burton relationship when they were reunited in 1983 to star in a production of Noel Coward’s Private Lives in the US. Two of the most famous film stars in the world during the 1960s and 70s, Burton and Elizabeth were married thirteen times between them, and married each other twice. This fascinating drama will tell one of Hollywood's most turbulent love stories. 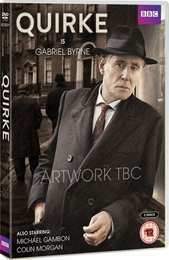 Last, but by no means least, we have the period crime drama Quirke which stars Gabriel Byrne and carries a recommended retail price of £20.42. Consultant pathologist in the Dublin city morgue in the 1950s, Quirke is a powerful character more at ease among the cold silent slabs than the company of his fellow men. But in truth, his profession provides his greatest pleasure: inquisitive by nature, he is fascinated with unlocking the secret to these cadavers’ deaths. After a body vanishes from his mortuary one night Quirke’s curiosity is piqued by the lengths his brother is prepared to go to, to cover up the cause of one young woman’s death in childbirth. As Quirke turns accidental detective, he delves deep into the secrets of Dublin, and discovers his investigations are more closely linked to his own life than he could ever have imagined. Little by little he is forced to confront the sins of his past as he peels back the layers of his own tangled family history.